Thurston’s surf team picks up new hardware. 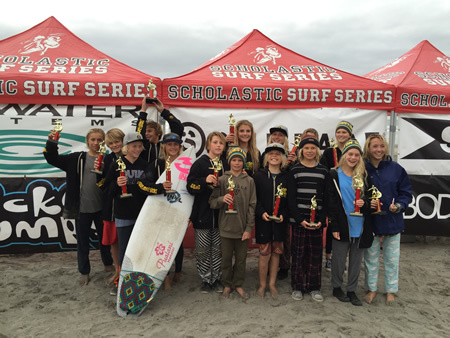 Thurston Middle School’s surf team came in second behind San Clemente during the Scholastic Surf Series at the Oceanside Harbor South Jetty last month. They achieved the best ever results in the team’s history with 16 of its surfers making finals. The Division I boys short board final was dominated by Thurston surfers with Nolan Rodgers taking second place followed by Kiko Nelsen in third, Trey Lockhart in fourth place and Travis Booth taking sixth place. Another final dominated by Thurston was the Division I girls short board with Kayla Coscino taking second place, Claire Kelly taking fourth and Kelly Smith in fifth place. Thanks to current coaches Jeff Booth and Bobby Lockhart, both former professional surfers, the team is enjoying remarkable success. And body board: Cole Fink fifth place.